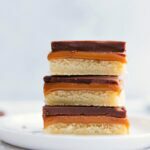 A delectable, homemade twix bar with a soft & chewy sugar cookie base, creamy caramel center, and a velvety smooth chocolate topping. 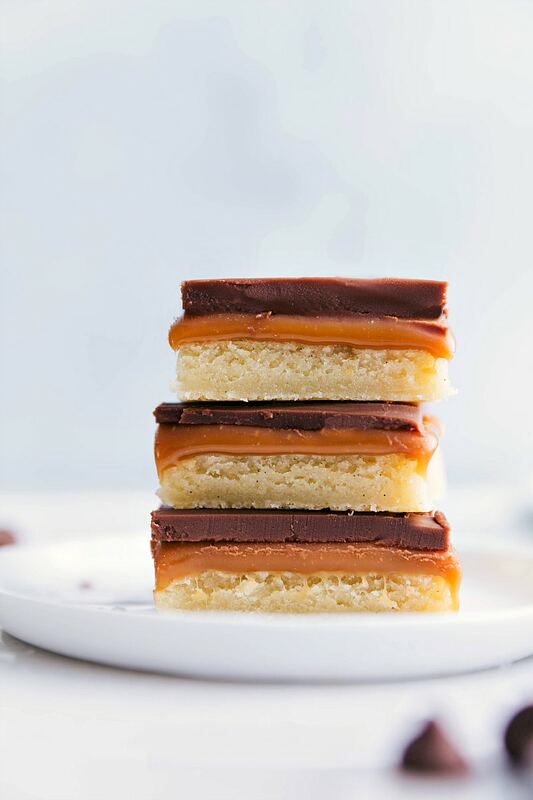 While the typical twix bar has a shortbread crust, we’re making these even better with a chewy sugar cookie base. The sugar cookie base is quick & easy to make, the caramel layer is only 2 ingredients (no homemade caramel! ), & the chocolate topping takes less than 5 minutes to assemble. These bars are easy to make, can be made ahead of time, and they’re the perfect treat to share with a crowd. If I had to pick my favorite candy growing up, it was a toss up between a twix bar and a kit-kat. I would say twix bars were the best, but every once and a while I got one where the shortbread was just too hard and it ruined the rest of the candy bar. Yes, I suppose I was a bit of a weird kid to analyze candy bars in depth haha! While I do love a good shortbread, there is nothing like a soft and chewy sugar cookie. So I’ve taken my favorite elements of a twix bar (gooey caramel and creamy milk chocolate) and placed it right on top of a sugar cookie bar. What is in a Twix bar? An actual twix bar has a butter cookie center, is topped with caramel, and everything is coated in milk chocolate. Sugar cookie base: this base can be made in a matter of minutes! Simply whisk together the dry ingredients, beat the wet ingredients, and then mix the two until just combined. You want to avoid over mixing the wet and dry to keep these bars soft and chewy. Caramel filling: only 2 ingredients: combine heavy cream and soft caramels in a small pot and stir until melted and smooth. I highly recommend Werther’s soft caramels for this recipe. 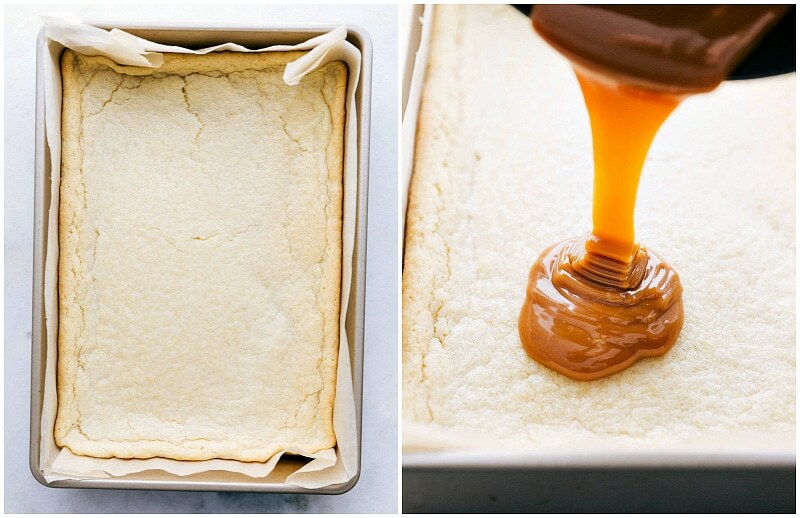 Add the melty caramel on top of the cooled sugar cookie bars. Chocolate topping: again only 2 ingredients! Combine butter and chocolate in a microwave-safe bowl and microwave until smooth and cream. Add on top of the cooled caramel layer and chill the bars until all the layers are solid. Carefully measure the flour: make sure to spoon and level the flour in the sugar cookie base to avoid dense/hard and flavorless bars. Use good caramels: the flavor of the caramel layer depends on good store-bought caramels; caramel ice cream topping won’t work here. Use high quality milk chocolate: again, the better the chocolate, the better these will taste. A traditional twix bar has a milk chocolate coating, but if you’re worried about the sweetness of these bars (they are SWEET! 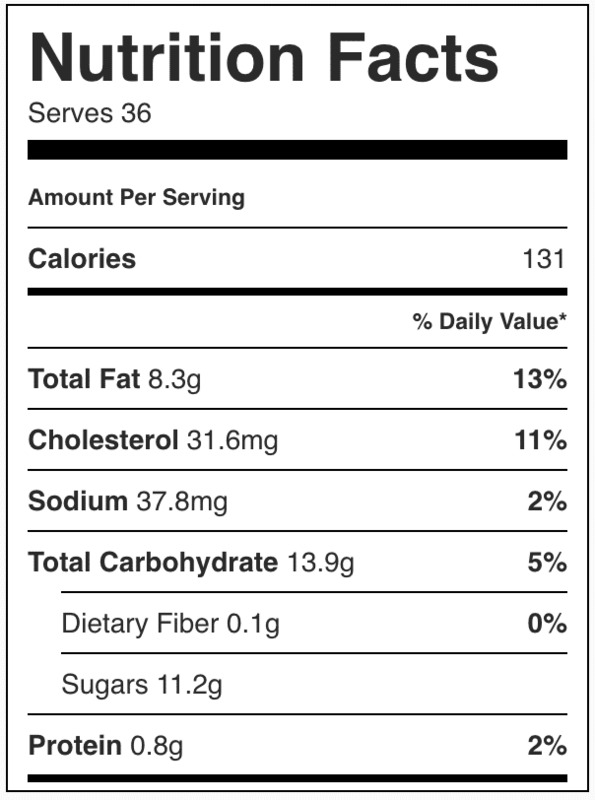 ), use semi-sweet or dark chocolate in place of the milk. Cut the bars with a hot and sharp knife: once the bars have chilled and are ready to be cut, make sure you choose a sharp knife. To avoid cracking the chocolate, run your knife under very hot tap water, quickly dry it off with a towel, and then make one cut. Repeat for each cut. Preheat the oven to 350 degrees F. Line a 9 x 13 pan with parchment paper leaving an overhang (do not skip) and set aside. Using hand mixers or a stand mixer fitted with the whisk attachment beat the butter and sugar for about three minutes, (on medium low speed) until it is pale and fluffy. Beat in the vanilla and almond extract. Beat in one egg at a time mixing for thirty seconds after each addition. Add in the dry ingredients and beat until JUST combined being careful to not overmix. 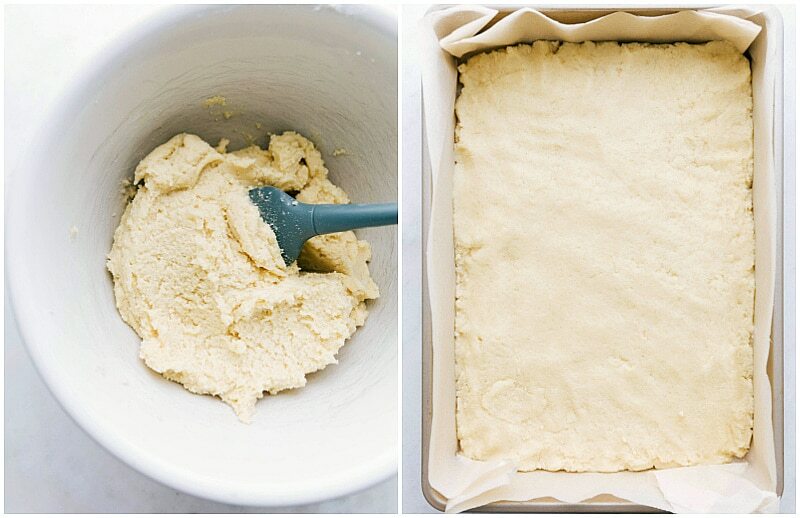 Press the cookie dough into the prepared pan and bake for 18-22 minutes. Be careful to not overbake. Remove from the oven and let cool at room temperature for 10 minutes and then place in the fridge for 20-30 minutes. While the sugar cookie is cooling, prepare the caramel layer. 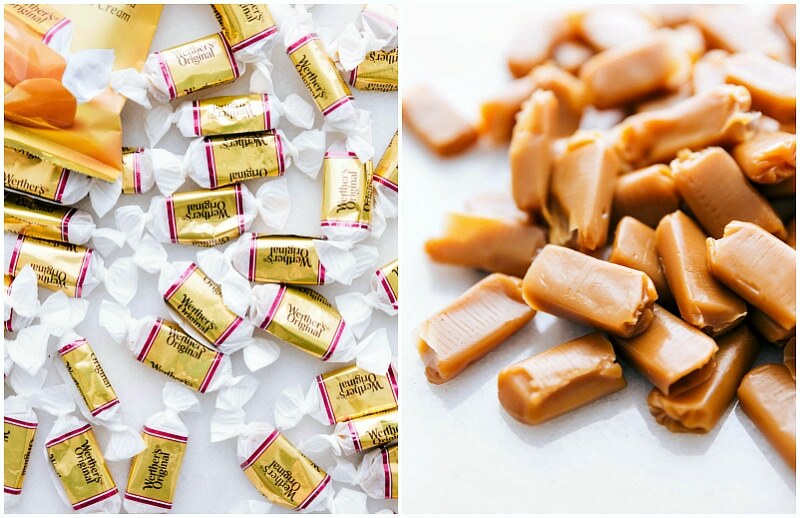 Unwrap all the caramels and place in a small to medium-sized pot. Add the heavy cream and heat over medium-low heat, stirring near constantly, until melted and smooth. Remove from heat and pour over sugar cookie bar layer. Use a spatula to spread into an even layer. Place in the fridge to chill for another 20 minutes. In a medium-sized microwave safe bowl, combine the chocolate chips and butter. Microwave in bursts of 15 seconds, stirring in between each burst for 15-20 seconds. 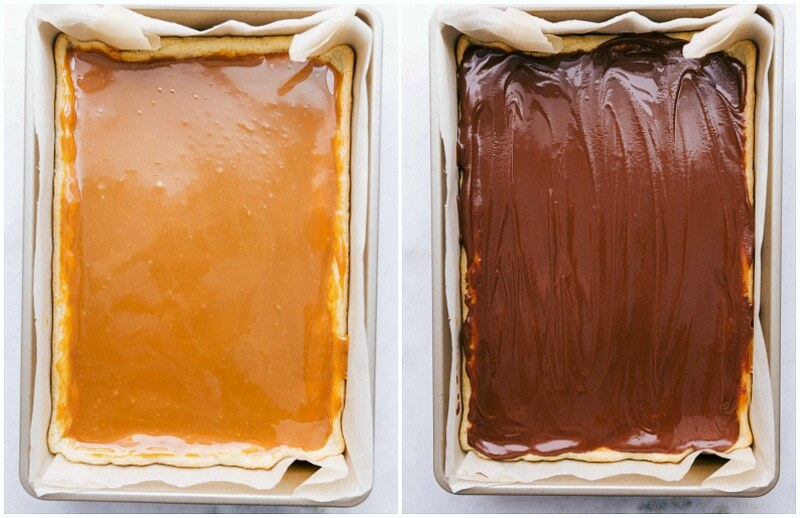 Once the chocolate is melted and smooth, pour over the caramel layer and smooth with a spatula. Place in the fridge for another 30 minutes to an hour or until bars are firm. Remove from the fridge and using the parchment paper overhang, remove the bars. Grab a very sharp knife and run it under hot tap water, quickly dry it off, and then make one cut into the bars. Repeat until all the bars are cut. Serve those cut bars immediately (don't cut until ready to serve or the caramel has a tendency to ooze out a bit). OH MY WORD. This is fabulous!